One of the greatest of genres in gaming ever created is the tower defense game. And at the top of the list in TD games is Bloons TD. The object of a tower defense game is to place defensive towers just off the path. This path serves as the route that the enemies will take. In the case of Bloons TD Battles, these enemies are balloons. These bags of hot air float in on one side of the map and if the defense towers don’t take them out, they will cause havoc to the player’s base. 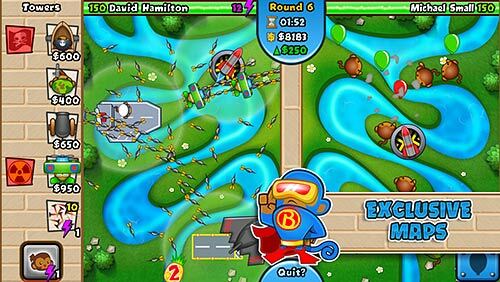 Bloons TD Battles takes the unique fun of Bloons and allows the players to battle their friends or the computer through waves of balloons. Players will race to build their towers before the first wave of balloons arrive, then must continue to build until all the waves are clear or the balloons have gotten through and the player’s base is destroyed. The screen is split into two opposite sides, each controlled by a player. 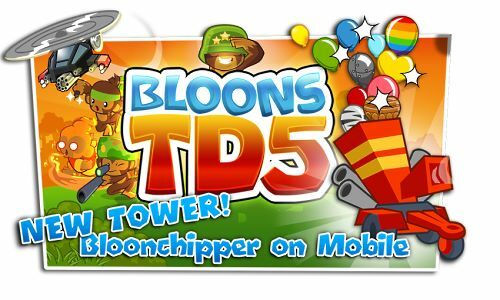 The towers in Bloons TD Battles are made up of monkeys, yep monkeys. These monkeys do what all monkeys do best and sling projectiles at the balloons. The balloons are easy to pop in the beginning but as the waves continue the balloons become harder to destroy as the player finds what hides inside the popped balloon, is more balloons to pop. And when those balloons pop even more balloons appear. The only way to stop the balloons advancement is to upgrade the monkey towers. There are 19 towers to choose from including a freezing tower and a machine gun. These towers can each be upgraded up to eight times for a price. When in battle with another gamer, players can send super charged balloons to bust through their opponent’s lines of towers. Players are also able to super charge a tower to fire faster but only for a limited time. 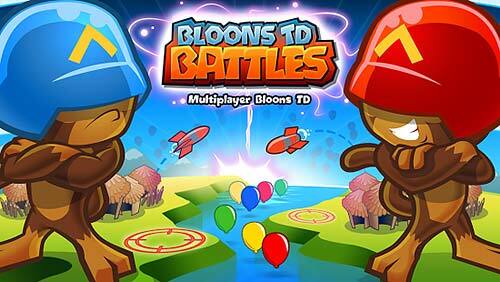 The sound quality of Bloons TD Battles is a bit of a hit and a miss. The sounds of the balloons being popped is a sound that should not be listened to, at all. Everything else about the game’s music is forgettable. The graphics are fantastic with the art style. It is everything that everyone loved about the original flash based games. The monkeys are well rendered with the cartoon look about them as they deliver death by flinging their arsenal at the balloons. The many towers are easy to distinguish from each other and the balloons are very colorful. The controls may take a little getting used to as the game makes use of the full touchscreen of the Google Android device. Swiping the screen to get the menus to scroll can be aggravating at times and sometimes multiple taps are needed for the game to realize what the player is trying to do, such as setting down a tower. Author Bio: We at monkeygamesworld.com, highly recommend Bloons TD Battles as a great tower defense game for beginners and fans of tower defense games. It is available for free on the Google play store and should be downloaded and enjoyed by all.